Woking Football Club | News | Republic of Ireland U21 Striker Signs! Republic of Ireland U21 Striker Signs! 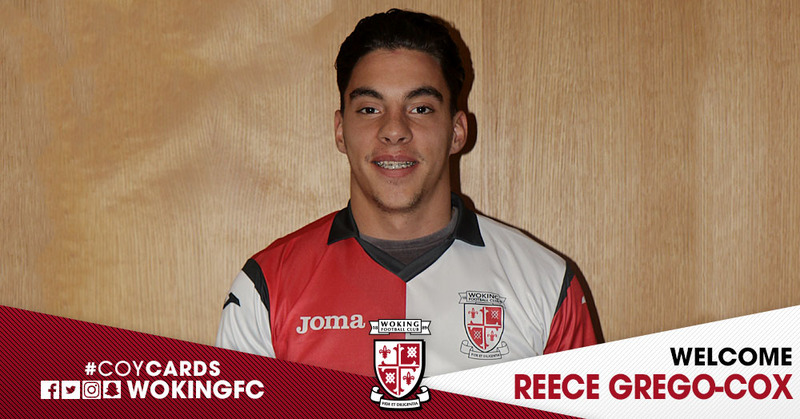 Woking Football Club is delighted to announce the signing of striker Reece Grego-Cox on a permanent contract. Reece, 21, started his career at Queens Park Rangers, joining the club at the age of 13, he progressed through the youth setup becoming a regular in the Under 18 & Under 21 teams. He signed his first professional contract with QPR in December 2014, playing in a friendly match on the same day with the first team against Southend United and scoring with his first touch. The young striker made his Premier League debut in March 2015 against Tottenham Hotspur, and went on to make 4 appearances in the Premier League that season. Reece has represented the Republic of Ireland at Under 17 & Under 19 level, and is currently in the Under 21 squad for the UEFA European Under 21 Championship qualification stages, where he scored a hat-trick in October in their 4-0 defeat of Israel. We welcome Reece to the Cards! Listen to an interview with Reece below.